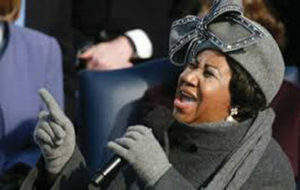 Aretha Franklin sings at President Barrack Obama’s Inauguration January 20, 2009. Aretha Franklin, arguably the greatest voice in music history, has died. The Queen of Soul was 76. “She will be so missed as a mother, sister, friend, cousin,” said longtime friend Roger Friedman, who also covered the Queen of Soul for decades and originally broke the story about her cancer fight on showbiz411.com. Franklin passed away at her home on Thursday, August 16. Dorothy Leavell, the chair-man of the NNPA and publisher of the Crusader newspapers in Chicago and Gary, Ind., said that she was saddened by the loss of the music icon. “I send a message of sadness and respect for our beloved Queen whose musical genius [shined brightly] and resound-ed around the world,” Leavell said. The fourth of five children, Aretha Louise Franklin was born on March 25, 1942, in Memphis, Tennessee, to Baptist preacher Reverend Clarence La Vaughan “C.L.” Franklin and Barbara Siggers Franklin, a gospel singer, according to her biography. Franklin’s musical gifts became apparent at an early age. Largely self-taught, she was regarded as a child prodi-gy. A gifted pianist with a pow-erful voice, Franklin got her start singing in front of her father’s congregation. By the age of 14, she had recorded some of her earliest tracks at his church, which were released by a small label as the album “Songs of Faith” in 1956. She also performed with C.L.’s traveling revival show and, while on tour, be-friended gospel greats such as Mahalia Jackson, Sam Cooke and Clara Ward. Franklin’s chart dominance soon earned her the title Queen of Soul, while at the same time she also became a symbol of Black empowerment during the Civil Rights Movement of the time. In 1968, Franklin was enlisted to perform at the funeral of Dr. Martin Luther King Jr. during which she paid tribute to her father’s fallen friend with a heartfelt rendition of “Precious Lord.” Later that year, she was also selected to sing the national anthem to begin the Democratic National Convention in Chicago. Prior to her passing this week, Stevie Wonder and the Rev. Jesse Jackson were among those who paid a visit to her at her home in Detroit. “I prayed with her,” Jackson said. And, Obama added, sometimes she helped us just forget about everything else and dance.